Traditionally, only students are honored at Honors Night. 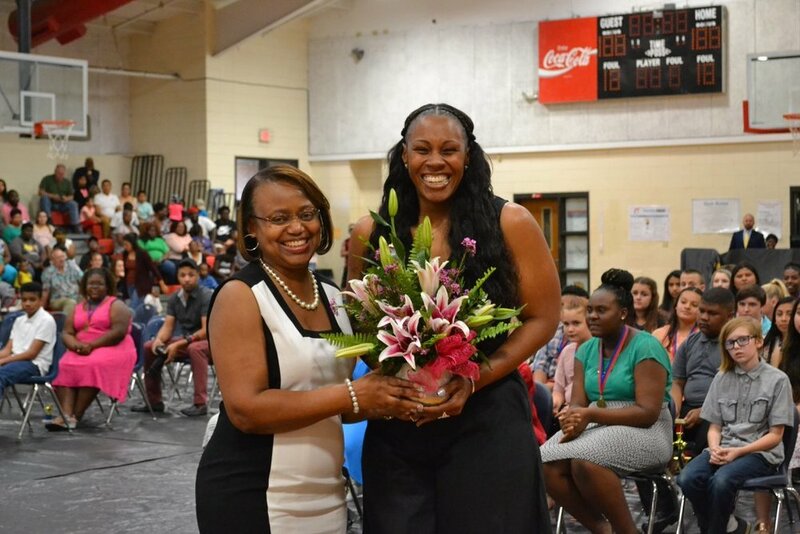 However at Brooks County Middle School’s Honors Night, Principal Christine Freeman announced the 2018-19 Brooks County Middle School’s Teacher of the Year as Ms. Christy Thomas. Mrs. Freeman stated, “Ms. Thomas is a dedicated teacher who goes above and beyond to contribute to the success of our students and school.” Ms. Thomas serves as the agriculture teacher at Brooks County Middle School and teaches grades 6-8. She also serves as the school’s advisor and sponsor of the middle school’s Future Farmers of America chapter. The chapter is very active and participates in regional and state conventions and competitions. She has been teaching for 9 years in the Brooks County School system. Ms. Thomas is a graduate of Brooks County High School. She graduated from Fort Valley State with a Bachelors of Science and from North Carolina Agricultural & Technical State University with a Masters of Science. She is the daughter of Jones and Gloria Thomas. She and her sisters, Nikki, Tiffanie & Kierra, were raised on their family’s farm in Dixie. Ms. Thomas stated, “Being a teacher is the most rewarding profession because I know that what I do every single day matters as I have the key to open the door that leads to the future for my students. This key is not the same for every student and that is what makes my job so unique. To some, the key is simple - I plan a lesson and I teach students to love agriculture. For others, the key is the opportunity to see that someone cares about them, and this is the key I cherish most. Building relationships and developing connections with those students who need to see a friendly face, hear an encouraging word, or simply have a safe space to come to without judgement are the things that give me purpose and remind me that the teaching profession is perfect for me.” Ms. Thomas will now compete for the Teacher of the Year for Brooks County Schools.